Send an EGG-stra special treat to someone this Easter with this set. 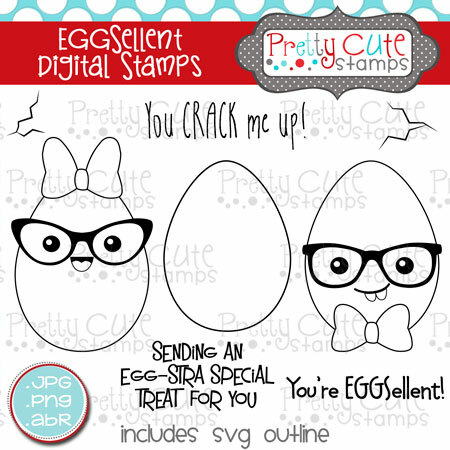 This DIGITAL set of 8 stamps features some adorable eggs with sentiments to match. These digital stamps come in three formats: PNG, JPG, (both @ 300 dpi resolution) and ABR files. SVG outlines for the images are also included in this set. These cutting files will make cutting out your digital images a snap! You must have a program that opens SVG files and an electronic cutting machine to use the SVG outlines. After purchase, a link to a zip file will be e-mailed to you. Please double check your junk/spam folder if you don't receive the email quickly. Download links expire one week after purchase.